From only 20 basic building blocks known as amino acids, the body makes literally millions of different kinds of proteins. Valine is an essential amino acid, meaning that the body cannot produce it on its own. It’s one of nine essential amino acids and is part of a special sub-group known as branched-chain amino acids (BCAAs). 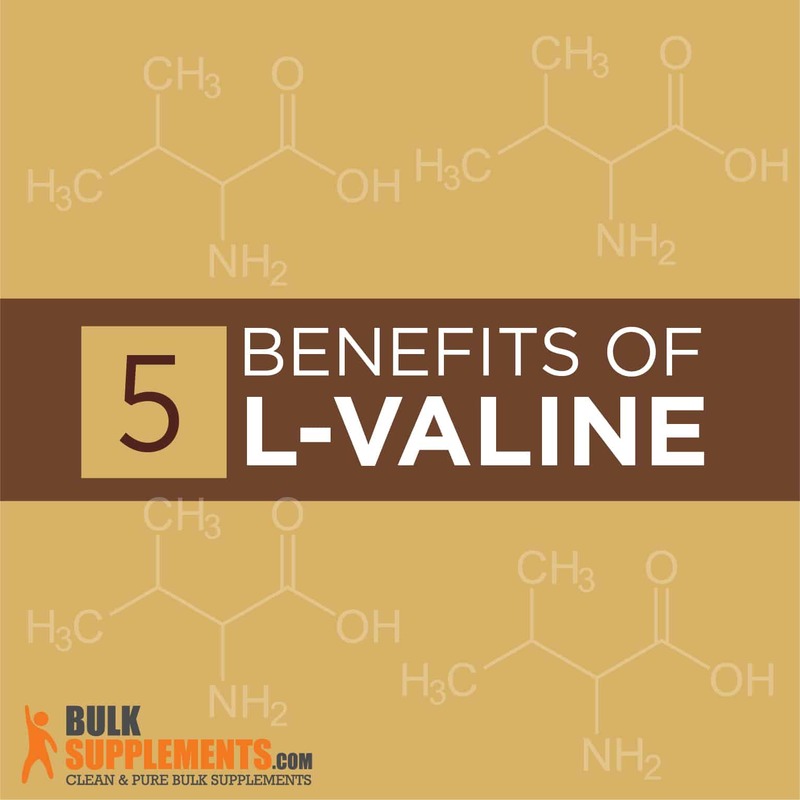 Along with the BCAAs isoleucine and leucine, valine has a unique function in the body. BCAAs comprise more than a third of the essential amino acids in muscle protein and 40 percent of all amino acids needed by the body. BCAAs regulate blood sugar, repair tissue, promote healthy growth and give you energy. Valine plays an important role in the central nervous system, ensuring proper mental function. It also strengthens muscle, reduces anxiety, and promotes sleep. Many athletes already know how important BCAAs like valine are for a good workout. Valine delivers additional glucose to the muscles, which helps to prevent muscle break-down during intense exercise–meaning you can get back to the gym faster, without worrying about post-workout muscle soreness. So how can valine benefit your health? Valine is best-known for its ability to build strong muscles. It boosts protein production, which is essential for muscle formation. In one study, particpants who took valine with leucine and isoleucine showed an impressive 22 percent increase in the creation of muscle protein compared to those who took a placebo (x). A supplement containing all the essential amino acids did an even better job of synthesizing muscle protein (x). Taking a vailne supplement could help reduce post-workout soreness and aid in muscle recovery. Feeling sore after a workout is common, particularly if you’re trying a new routine. You might not feel the burn immediately–it usually hits the day after you exercise, and it can last up to three days. Researchers don’t know exactly what causes this delayed reaction, but they believe strenuous exercise actually leaves micro tears in your muscles, resulting in that characteristic pain you feel after an intense weightlifting session. The good news is valine can partially prevent this damage to the muscles, reducing the severity and length of time people experience soreness after a workout. It decreases the breakdown of proteins during exercise, as well as the level of an enzyme called creatine kinase (CK) — one of the indicators of damaged muscle (x). We’ve all been there: this is the day you’re finally going to increase your weights and get out of that plateau you’ve hit. But before you can give the Rock a run for his money, it happens: the burnout. That “I-couldn’t-lift-a-pencil-at-this-point” level of fatigue that sends you shuffling out the gym doors before you could even hit your max. So what gives? Why do you get so tired when you exercise? It’s actually partly valine’s fault–during a workout, your muscles use up their valine stores, which results in a decrease in the amount in your bloodstream. As valine levels drop, levels of another amino acid called tryptophan increase. Tryptophan later becomes serotonin, the chemical messenger that tells your brain you’ve done enough and it’s time to stop (and time to sleep). Adding valine to your preworkout can ensure your muscles stores don’t deplete so you can improve your athletic endurance. Studies have shown that a supplement including valine and other BCAAs can improve mental focus and endurance, lessening the effect of fatigue during a workout and allowing you to finish those laps on the treadmill (x). Your muscles are perpetually in flux as your body disassembles and rebuilds them anew every day. The amount of protein in a muscle is the net difference between what’s being broken down and what’s being rebuilt. Muscle breakdown or ‘wasting’ happens when your muscles break down faster than they can be built.Muscle wasting occurs due to malnutrition, diseases such as cancer, chronic infection, during fasting and also (unfortunately) as a part of aging. But valine may prevent the breakdown of muscle tissue. Taking a valine or BCAA supplement may slow or even reverse muscle wasting (x). Cirrhosis of the liver is a chronic illness in which the liver ceases to function properly. This disease kills more than 30,000 Americans every year. Even for those who survive, half of cirrhosis patients will suffer brain damage due to the liver’s inability to clear toxins (x). But valine could help alleviate some of the symptoms of cirrhosis, although it does not appear to affect mortality rates (x). Still, it may improve the health of people with liver and gallbladder diseases, and early research suggests could also protect against liver cancer (x). While valine deficiencies are unusual, certain populations may have lower valine levels than others. Branched-chain ketoaciduria (or ‘maple syrup urine disease’ due to the fact that the condition causes urine to smell like maple syrup) is a rare, but serious genetic disorder in which the body cannot metabolize BCAAs. Untreated, it can lead to permanent cognitive damage and even death. Vegetarians, vegans and others who consume a diet low in protein are at risk for deficiency, as are people who exercise strenuously, particularly bodybuilders, due to their muscles’ high demand for valine. Symptoms of valine deficiency include muscle weakness, difficulty with coordination and high blood pressure. Because valine is necessary to build and maintain the sheaths which insulate nerves, valine deficiency also leaves you at risk for developing dangerous neurological problems. Other conditions resulting from deficiency include obesity and elevated insulin levels. Valine occurs naturally in foods, making it generally tolerable for most people. However, excessive amounts may cause fatigue, nausea and a lack of muscle coordination. Excessive amounts can increase ammonia levels, causing stress on the liver and kidneys. Extreme doses can cause your skin to tingle, and may even lead to hallucinations. Because your body can’t make valine on its own, you have to get it from food sources. Valine is abundant in a variety of food sources including meat, fish, eggs, cheese, peanuts, mushrooms, leafy greens and seeds. If you choose to supplement all three BCAAs together, the recommended dose is two parts leucine and one part valine and isoleucine. As a dietary supplement, take 1000 mg to 2000 mg (or 1/2 tsp) once or twice a day, depending on individual needs, or as directed by physician. Before adding valine to your diet, you may wish to consult with a physician to ensure its safety. Those who have a compromised liver or kidneys may not be good candidates for a valine supplement. Valine, isoleucine and leucine make up the branched-chain amino acids or BCAAs. These amino acids are vital to muscle growth. While a protein supplement containing all of the essential amino acids promotes faster muscle growth, your body can’t use them until after the digestion process, and this can take several hours. A free-form BCAA supplement will enter your bloodstream much faster, meaning it will get to work right away to keep your BCAA levels high during a workout. 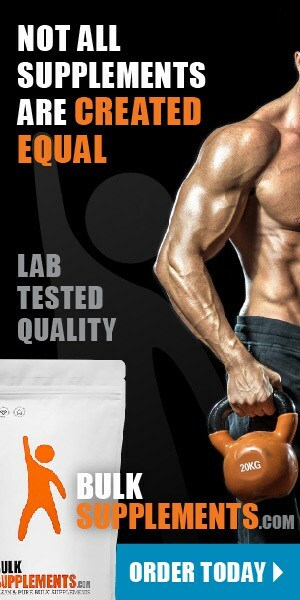 L-valine is an essential amino acid and a BCAA. 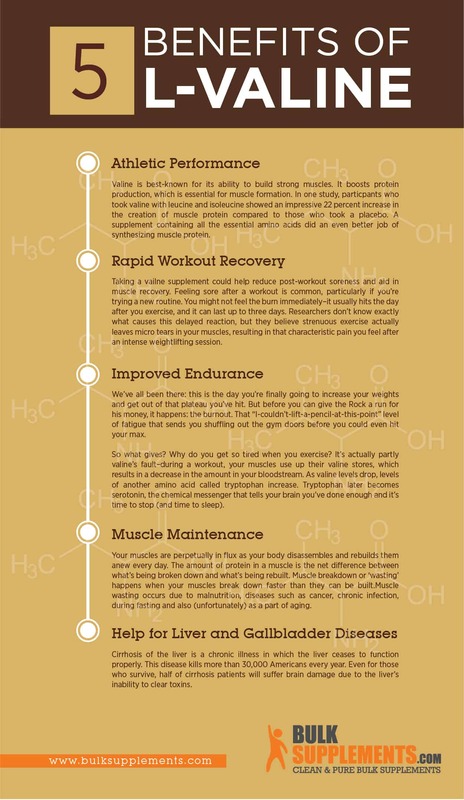 It plays an especially important role in increasing muscle mass and improving endurance. While valine may not be the right supplement for those with liver or kidney disease, it’s generally safe for most people. There’s a reason bodybuilders and fitness junkies swear by valine: it can take your performance in the gym to the next level.